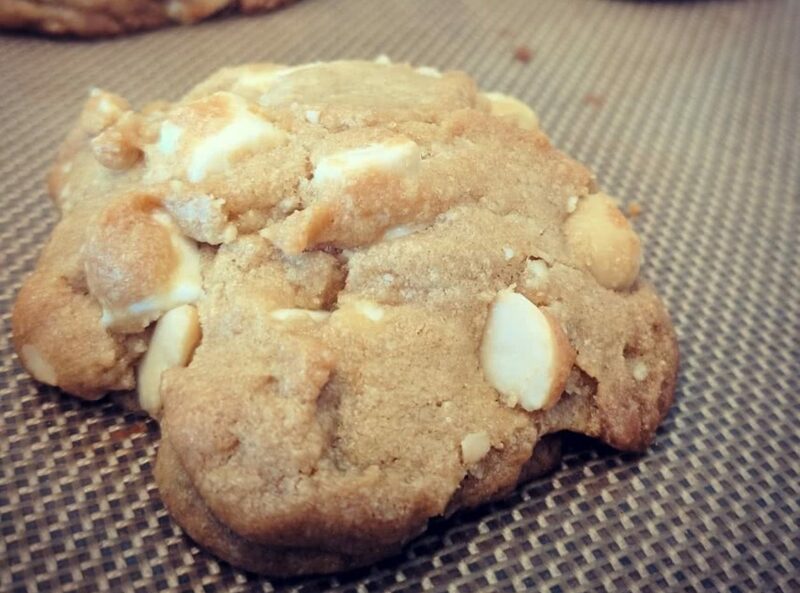 One of our favorite cookies to get out at bakeries is the white chocolate chip macadamia nut variety due to the high cost of macadamia nuts and the typical low quality options for white chocolate at grocery stores. Luckily we were gifted some macadamia nuts from a friend who returned from Hawaii and came across some white chocolate chips from a local chocolatier, so we knew we had to come up with a delicious recipe. By browning the butter first and allowing the dough to rest, these pillow-y cookies have the perfect balance of a slightly crisped exterior and a soft and nutty interior. Place the butter in a small sauce pan and melt it over medium-high heat. Cook the butter by swirling the pan constantly, you will see the butter begin to froth and foam aggressively from the 2-4 minute mark, and right around the 5 minute mark this will subside. Make sure to watch the butter closely from the 4-5 minute mark as it will change almost instantly and begin to smell nutty and you will see the butter particles drop to the bottom of the pan in a rich golden brown color. Remove from the heat at this point and swirl for about fifteen more seconds and transfer to a medium bowl. Whisk in the ice cube and place the butter in the fridge to cool or place over an ice bath and whisk occasionally until it is no longer liquid. In a large bowl, beat the melted butter with the brown and white sugar on medium speed with an electric hand mixer. Add in the egg, egg yolk, and vanilla until the mixture is combined. Slowly add the flour mixture to the butter mixture with the mixer set to low. Make sure to not overmix and just add the flour until it disappears. Mix in the white chocolate chips and nuts until just combined. Transfer the dough to the refrigerator to rest for 8-24 hours. Preheat the oven to 325 degrees and line a baking sheet with parchment paper or a silplat. Place the oven rack in the middle position. Roll the dough into balls (roughly 2 Tablespoons or 54 grams), six should fit on a standard baking sheet. After rolling the balls, pull them into two halves and smash them back together. You want rougher/craggly outer edges to get a nice balance of the slight crunch on the outside with a soft inside. Bake for 14-16 minutes, they will be done when the edges are a rich brown and the centers are soft and puffed. Remove and let cool on the baking sheet for 10 minutes. Remove to a wire rack to cool completely. We enjoy these at room temperature best vs warmed. This makes around 20 total cookies based on the 2 Tablespoon/54 gram measurement.